60 offers from 52 different universities. Habib S: Suffolk University, Mass. Samar N: Ithaca College, her first choice school! Jeong Kyu: New York University, Abu Dhabi, his first choice school! Titus O: State University New York, at Binghamton. Seif H: U Penn, the Huntsman Program. His first choice school! 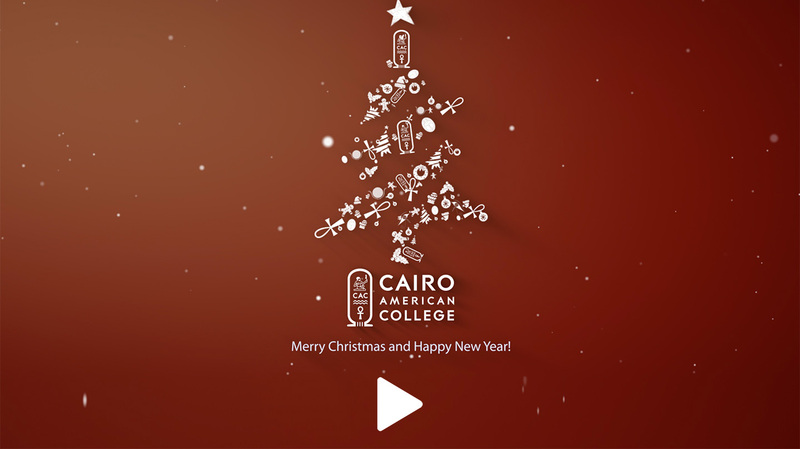 Amina E: Sarah Lawrence College, and Emerson College. Calvin C: Trinity University, with an outstanding scholarship. Youssef A: Lesley University, Cambridge, Mass, his first choice school! And…..drumroll, please…..Hesham A: Harvard University, his first choice school! “Beginning in 1994 and graduating its first class in 1998, the Huntsman Program in International Studies and Business brings together the curricula of two undergraduate schools at the University of Pennsylvania: the liberal arts curriculum of the College of Arts and Sciences, and the business and finance curriculum of the Wharton School. The link between the two schools—the curricular focus of the Huntsman Program—is the International Studies component, combining the developing professional competence in one of eleven foreign languages with the study of a particular world area where that language is the predominant means of communication and a set of courses—mostly but not entirely in the social sciences—which will provide a theoretical background to this central core of the program.” You can read more about it here. Please be aware that the CAC Gym Building, Pool and Track will be on ‘winter break hours’ from Dec 21 through break, closing at 8pm from Dec 21- Jan 13 (as opposed to being open later in the evening). Booster Club thanks everyone for helping decorate the CAC Holiday Tree! Watch out for more festive activities out by the tree Sun-Thurs next week, immediately after school. Buy your Gala tic kets now! The Gala is February 1st at the Sofitel Nile El Gezirah. Tickets will be sold again after winter break. The tickets are 1600 EGP or $90 each.! Get a table for all your friends! Tables seat 10. CAC members may buy tickets for non-CAC guests. 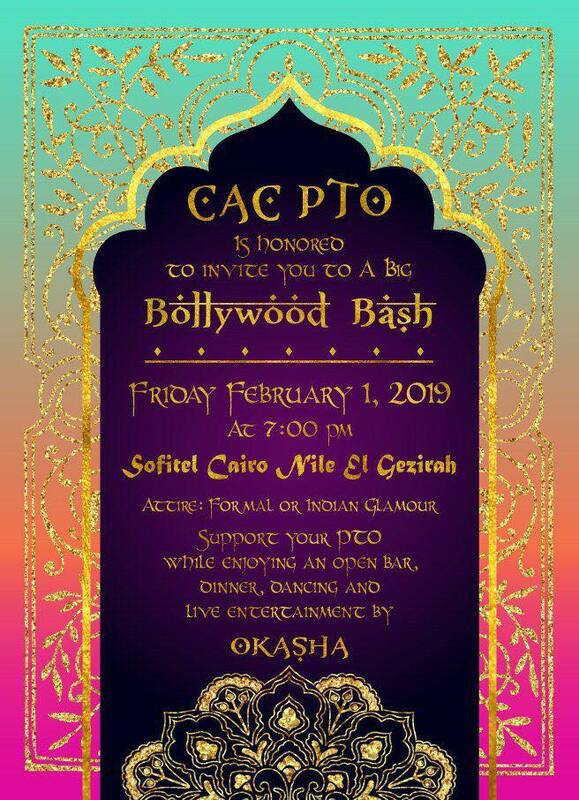 Ask anyone who has been to the gala the past couple of years; this is a really FUN event and the best value for your money among all the galas in Cairo! Plus, you will be supporting your PTO which benefits your children! There will be complementary bus transportation in between CAC and Sofitel for this event. Further details regarding how to sign up will be available in January. Next PTO Meeting is Tuesday, January 15th at 1:30 pm. MS students use their break time to pack Christmas gift bags of donated items, as Mr. Kasal looks on. Thanks to all who donated! 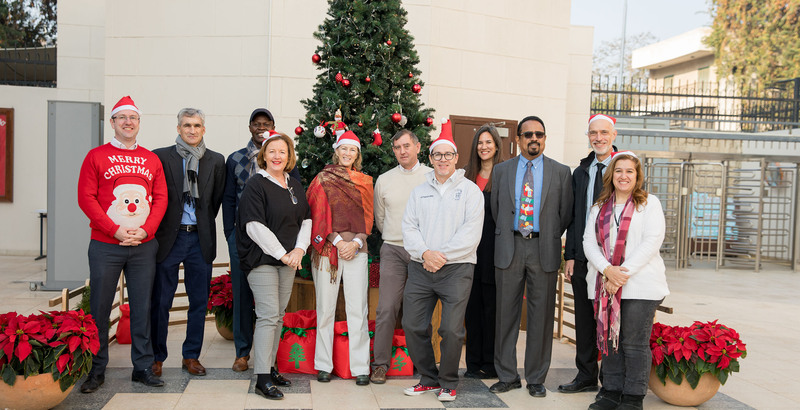 CAC faculty and Staff gather for ‘winter cheer’ a last-day tradition put on by the campus Wellness Committee. A bit of excitement in the neighborhood early Thursday morning: this large tree fell down at the midan closest to the ES at about 5:30am. No one was hurt, though a car and a scooter had passed under it (both going the wrong way, by the way) just about 10 seconds before the tree came down. It fractured the water line, so also created a flood on Road 253 this morning. The mess was cleared up by about 10am by the municipality, using a large backhoe.